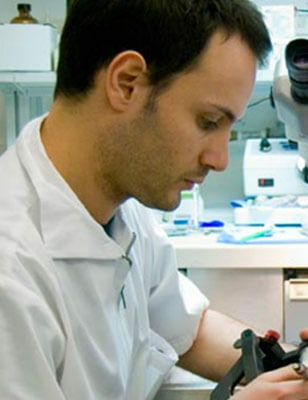 Marco Marsiliani is a highly trained, meticulous and professional dental prosthetist. Following in his Italian family’s tradition, he began his career in Rome when he was just 16-years-old. As he studied to achieve his technical education and certifications, he spent more than a decade training directly under his uncle, an internationally renowned dental technician. Marco graduated from the E. De Amicis Institute of Dental Technology in Rome in 1997. He then completed a specialized course in porcelain design in 1999. Once in the U.S. he attained further education, attending numerous lectures and hands-on courses with top-notch prosthetists around the country. Marco has attained the Ivoclar Certification under Oliver Brix for porcelain crowns and laminates; the Wili Geller Certification, known as the “master of cosmetics”; and a certification in Oral Design Technics with Antonello Remartini. Marco continues to educate himself through continuing education seminars all over the world. Today, Marco is a highly knowledgeable and passionate professional, with more than 17 years of experience. He uses only the most innovative techniques, cutting-edge technology and the best materials. Together with doctors and patients, he is actively involved in the treatment-planning process, as he strives to further improve and customize patients’ restorations and satisfaction. Call today to request an appointment.